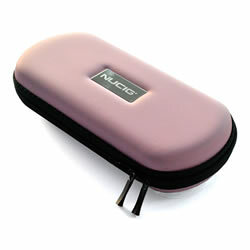 Large Luxury NUCIG Ultimate Ego carry storage case pink colour. 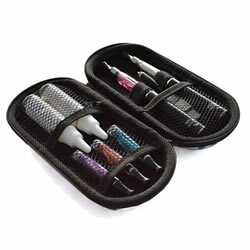 Zipper case to hold, organise and protect your ultimate electronic cigarettes, eliquids, tanks and spares. Contains 3 inner meshed pockets and 2 elasticated holding bands. Tough and sturdy to protect contents. Plenty of space to store and organise 2 complete electronic cigarettes, usb charger cable, eliquid bottles and more. Various designs & colours available. Liked my red one so much that i treated myself to a pink one. essential item to keep all bits safely together. Good product and a good price.